Gizmo Dorks PLA filament now comes in a smaller version on a 200 gram spool, the perfect size for sampling or testing the superior quality. Gizmo Dorks PLA filament is made from the highest quality virgin material. PLA, Polylactic Acid, is created from processing a number of plant products. PLA can be composted at commercial facilities unlike ABS which is derived from fossil fuels. PLA is a more earth friendly plastic and more rigid than ABS, and in general the printed objects will have a more glossy look and feel compared to ABS. PLA can be sanded and machined. 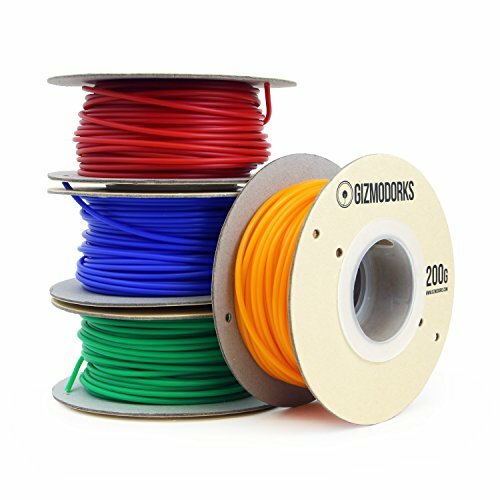 PLA has a lower melting temperature compared to ABS. As a material, PLA has much less warping versus ABS. Additionally, a heated bed is not required to print it. PLA generally enjoys sharper details and corners compared to ABS without the risk of cracking or warping. PLA can also be printed at higher throughput speeds. *Each color pack contains four 200 gram spools. Net weight: 200 grams / Spool Diameter: 5.125" / Spool Width: 2" / Spool Hub Diameter: 1.5"
View More In 3D Printing Filament. If you have any questions about this product by Gizmo Dorks, contact us by completing and submitting the form below. If you are looking for a specif part number, please include it with your message.